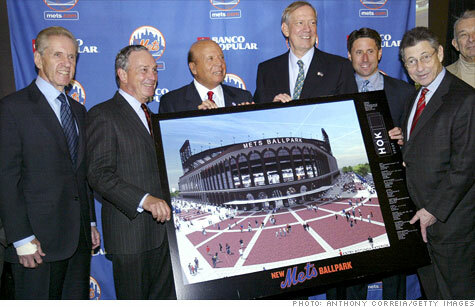 A federal judge's ruling regarding a lawsuit from the trustee in the Bernard Madoff case favored the owners of the New York Mets, including Fed Wilpon, left, and Saul Katz, third from left, shown here in 2009. NEW YORK (CNNMoney) -- In a win for the owners of the New York Mets, a federal judge on Tuesday upheld an earlier court decision that placed limits on the amount of money that the trustee in the Madoff case can seek. Judge Jed Rakoff shot down an attempt by Irving Picard, the trustee handling the recovery of assets stolen by Bernie Madoff, to lift the cap on potential damages. Picard has been attempting to collect $1 billion from Mets owners Saul Katz and Fred Wilpon, but Rakoff dismissed most counts of the lawsuit in September. The trustee was seeking $300 million in profits the Mets owners gained from investments with Madoff and $700 million in principal that the owners deposited and then withdrew from Madoff's firm. Picard sought to appeal the court's opinion of Sept. 27, 2011, when the court dismissed some of the trustee's claims against the owners of the Mets, who had invested in Madoff's firm before it unraveled with his arrest on Dec. 11, 2008. At that time, the court ruled that the $700 million in principal could only be recovered with a higher burden of proof -- stronger evidence was needed to prove that the Mets owners "willfully blinded themselves" to Madoff's fraud, the court said. Rakoff reiterated this finding on Tuesday, in a document filed with U.S. District Court in the Southern District of New York: "After careful consideration, the court concludes that the trustee has entirely failed to demonstrate the kind of extraordinary circumstances that would warrant this court in granting his motion." A representative for Mets owner Saul Katz, who was named in the ruling, declined to comment. A lawyer for the trustee also declined to comment. But the issue isn't completely over. A court trial has been set for March 19. Madoff was a Mets fan, judging from his satin Mets jacket emblazoned with his name. The U.S. Marshals seized the jacket along with his other assets -- such as his $7 million Manhattan penthouse and his yacht named "The Bull" -- and the jacket fetched $14,500 at auction. The trustee places the proceeds from Madoff's confiscated assets into a recovery fund for victims of the Ponzi scheme. As of Sept. 30, 2011, the trustee said he'd recovered, or was in the process of recovering, $8.7 billion of the $17.3 billion in estimated losses from Madoff's scheme. Much of the Picard's recovery efforts have consisted of lawsuits against individuals and firms that he believes have profited from Madoff's scheme, knowingly or not. Some of these efforts have been successful, like the $7.2 billion settlement reached with Barbara Picower, the widow of investor Jeffry Picower. But some have been unsuccessful, such as the $19 billion suit against JPMorgan Chase (JPM, Fortune 500) and the $2 billion suit against UBS (UBS), which were both dismissed in November. As of September, some $2.7 billion had been distributed to victims. The trustee has determined 2,703 claims from victims as legitimate. Madoff pleaded guilty to his crimes in 2009 and was sentenced to 150 years. He is currently residing at a medium-security federal prison in Butner, N.C.